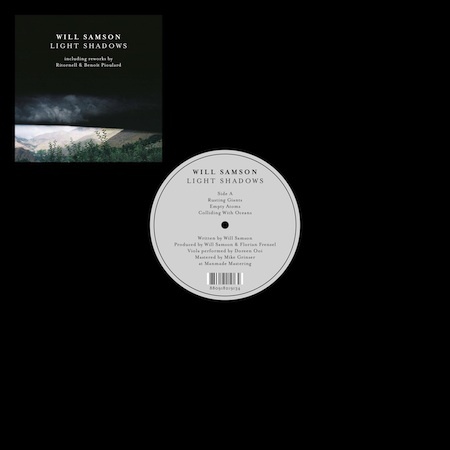 Quietly & unceremoniously released as a digital EP at the tail end of 2013, Light Shadows returns as a highly limited 12“ vinyl, including two new reworks by Austrian electronic/experimental duo & label mates, Ritornell, & ambient sonic explorer, Benoit Pioulard. Since the release of Balance (‘an unusually intimate collection’ 8/10 – UNCUT Magazine) in October 2012, Will has travelled across the UK and Europe, touring and sharing stages with Kurt Vile, Ólafur Arnalds, Valgeir Sigurðsson, Marissa Nadler, Shearwater, Pinback, Do Make Say Think & more – as well as performing his own headline shows. On top of this, Will managed to find time to venture into ‘dance’ music and create It Grows Again – a collaborative EP with London based producer, Tom Demac (Aus Music), which garnered mainstream radio play within the UK. However, it was personal experiences of a radically different nature that shaped the outcome of Light Shadows. During the summer months between the completion & release of Balance, Will unexpectedly found himself facing an extremely close & profound experience of death. Following the aftermath of such a loss, he briefly retreated to India, seeking some time & space to gently reflect on the recent life-changing events. Travelling alone from the Southern tip, all the way up to the mountains in the North, this is where the first ideas of new songs slowly began to seed. A few months after landing back in England, Will then travelled onto Berlin to begin refining and recording these ideas with close friend, Florian Frenzel (who had also helped to produce ‘Balance’). Using their familiar selection of tape machines (many of which had now broken since the previous year’s recording sessions) and home-made outboard gear, the pair crafted away on Samson’s scrapbook of sounds until they eventually emerged with this deeply cathartic collection of music.